With increasing pollution and decreasing temperatures, it is important to have indoor play-spaces for young children so that they can run around in clean air. 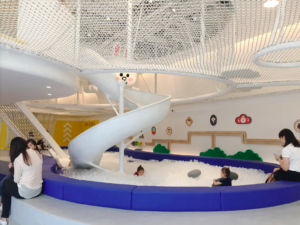 Located on the 3rd floor of the high-end Yintai centre in Beijing’s CBD, inKIDS with LINE FRIENDS is a new play-space designed for young kids and their parents to spend a day running around and having fun. 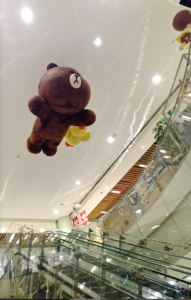 As the elevator approaches the 3rd floor, a huge flying teddy bear soars overhead, marking the entrance to the toy heaven. Loved by young children and adults both, the adorable teddies, ducks and frogs that were initially envisioned as mobile stickers watch over the ball pits and pens where children play. 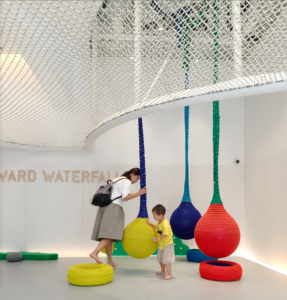 Areas like the Edward Waterfall (featuring large swinging balls that hang from the ceiling) and Sally Lake (a sea of clear plastic balls perfect for diving into), bring character to the fun space. There is also a white netting that runs across the upper floor of the play area and is both a safe and exciting running space for the kids. Corners are padded and all surfaces are clean, making it possible for parents to let their children run free without worrying too much. Most kids are accompanied by their parents around the play areas. Shoes are not allowed but socks are available at the entrance. There is a cafe and sitting area for parents to relax, chat and work while enjoying the view over the Beijing financial centre. Kids under 10 would be most suitable age group for this area. There is a separate room specially for birthday parties decked out with colourful bunting and yet more toys. This room can be rented out for private events and birthday packages may be available on request with inKIDS. The playground is all indoor so great for Beijing winter and polluted days! You will have to contact the Yintai Centre (电话 Telephone：（86-10）6566 6060) for the entrance fee as it may vary.